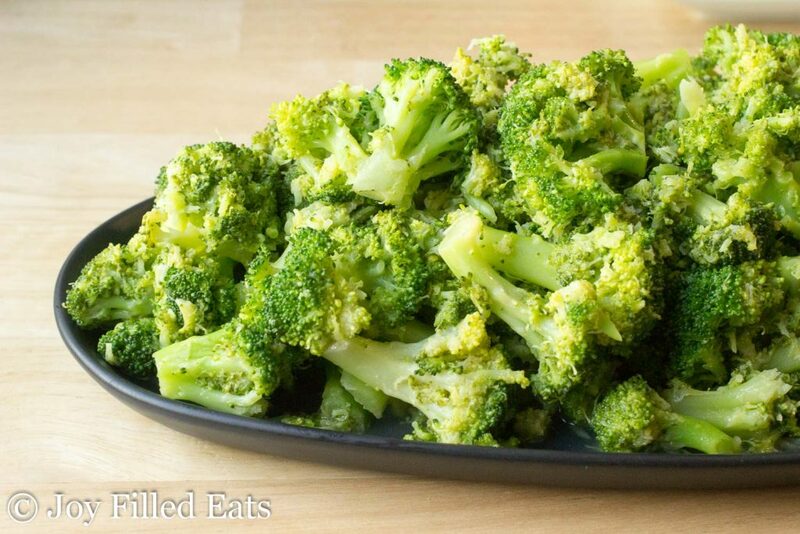 This Garlic Broccoli Side Dish Recipe may not look like much but it is the best broccoli you will ever eat. I could seriously eat pounds of this stuff. 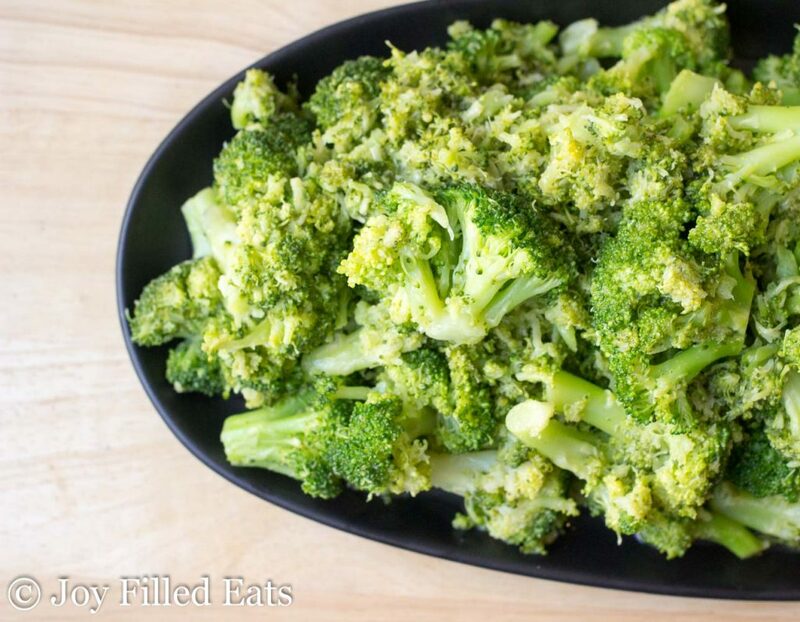 I promise you this Garlic Broccoli Side Dish Recipe is not just any old broccoli. Every bite is bursting with flavor. My Aunt Kathy is known for her high heels, gold lipstick, and fabulous cooking. I love when she hosts holidays because she goes all out and every dish on her table is delicious. She is an amazing lady. In our family, she is famous for this broccoli. I’m sure you will find out why as soon as you try it. I make a whole 3-pound bag of broccoli florets from Costco and as soon as I add the lemon garlic dressing the broccoli starts to disappear. I grab a few pieces, my husband comes into the kitchen and grabs a few more, and then every kid who walks through the kitchen. It’s amazing if there is a decent amount left when we actually sit down for dinner. I steam my broccoli for about 8 minutes. I put about an inch of water in the bottom of the pot, add the broccoli, cover, and bring to a boil. Then I set the timer for 8 minutes. I like my broccoli a little on the softer side. If you want it crisper check it after 5 minutes. 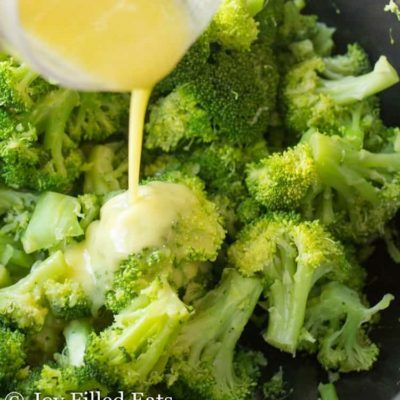 Then you can proceed with the important part of this Garlic Broccoli Side Dish Recipe, the lemon garlic dressing. I doubled this recipe and the broccoli took closer to 12 minutes since there was so much in the pot. Once you hit the five-minute mark just taste a piece every couple minutes until it is slightly crisper than you like. It will get a little softer as it sits. I do not put it in cold water because I don’t want to wash away any nutrient. 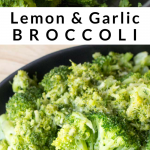 To make the lemon garlic dressing for my Garlic Broccoli Side Dish Recipe simple blend together 4 simple ingredients: a good quality olive oil, fresh lemon juice, garlic powder (raw garlic is too strong), and salt. 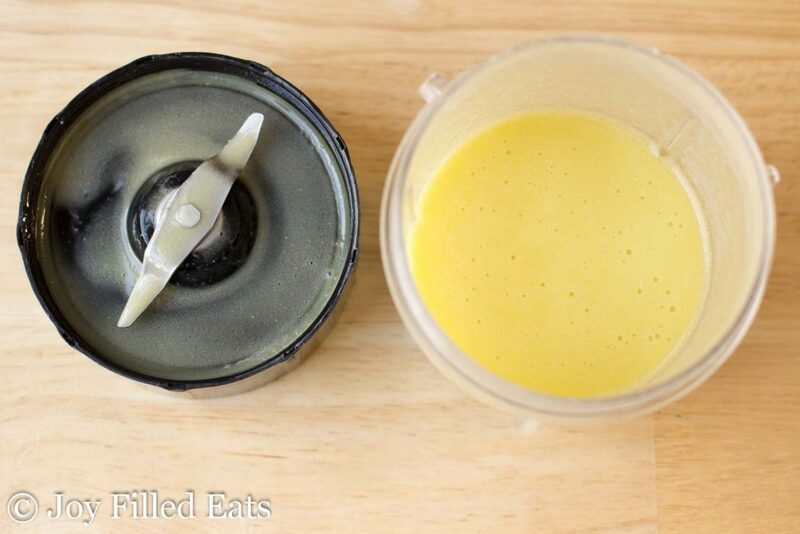 Blend the lemon garlic dressing until creamy. 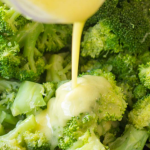 The olive oil and lemon emulsify and make a creamy dressing without any dairy ingredients. I’ve tried to get away with using a lesser quality olive oil and can definitely taste the difference. If you use a cheap olive oil the dressing can taste bitter. 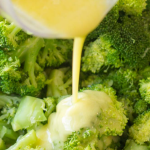 Pour the lemon garlic dressing over the broccoli, toss gently, and the perfect Garlic Broccoli Side Dish Recipe is complete. I prefer this made fresh and eaten when it is warm. But it is also great chilled. On a hot summer day, this is such a refreshing accompaniment to grilled chicken or burgers. Make sure you do use a tasty olive oil and fresh lemon juice. Cheap olive oil and bottled lemon juice do not work in this dish. It is so simple that quality ingredients are key to success. Sometimes my family will even just squeeze a little fresh lemon juice on our broccoli, sprinkle with salt, and call it a day. 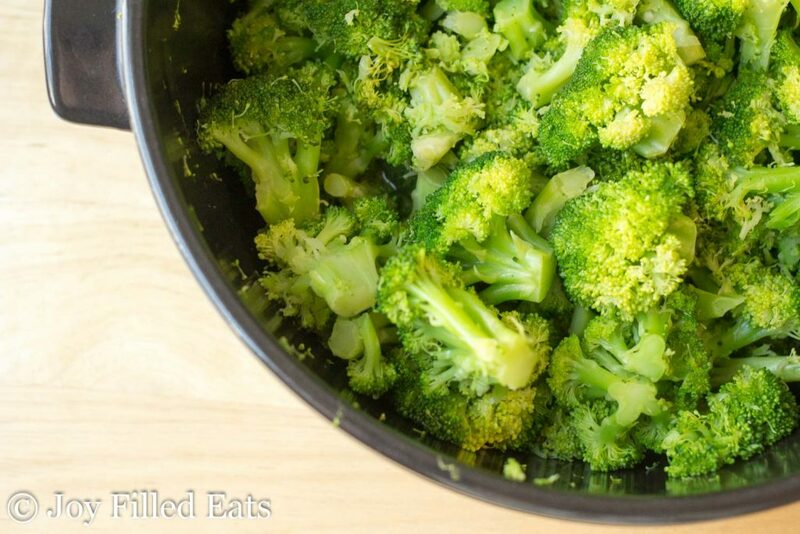 It isn’t hard to dress up a simply steamed broccoli recipe. 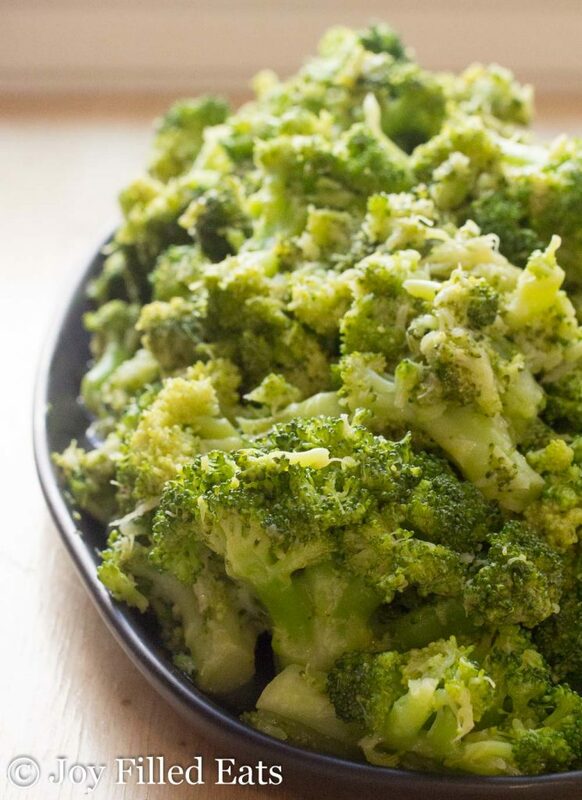 This Garlic Broccoli Side Dish Recipe may not look like much but it is the.best.broccoli you will ever eat. I could seriously eat pounds of this stuff. Steam broccoli until tender. Drain. 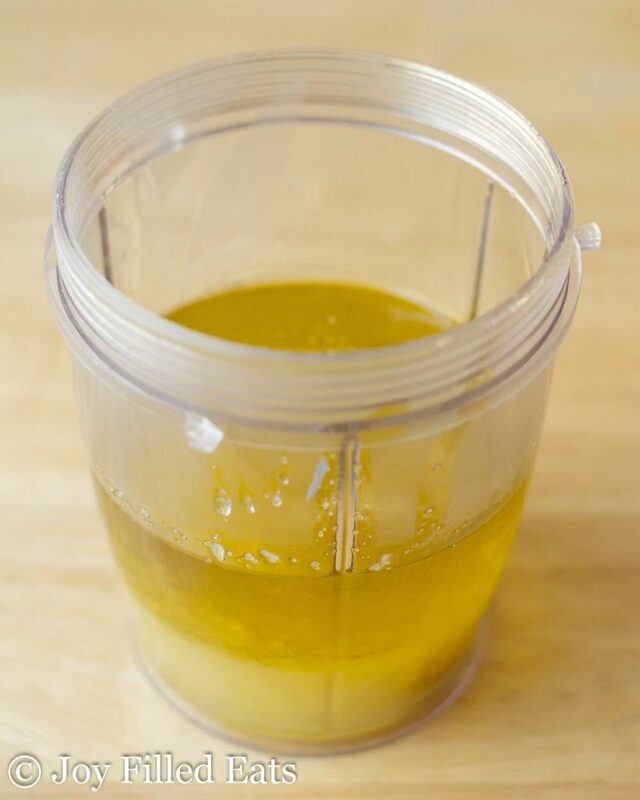 Meanwhile combine olive oil, lemon juice, garlic powder, and salt in a small blender. Blend until creamy. 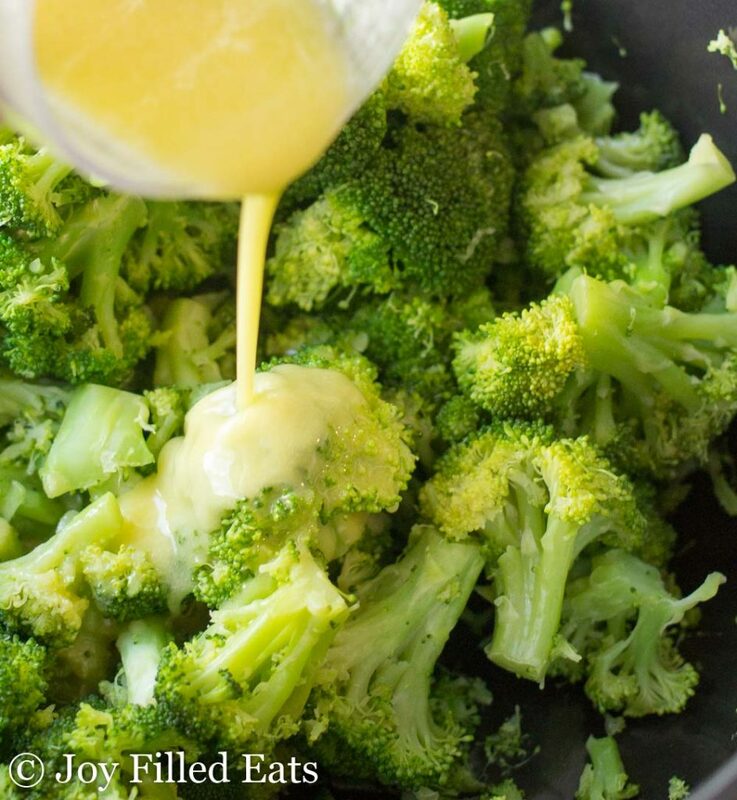 Pour the lemon garlic dressing over the broccoli and toss gently. Season with additional salt as needed. Lemon & Garlic are very nice together. Thanks for sharing! This broccoli was amazing! Thank you for the recipe! Ive used this recipe for years but mostly on brussels sprouts. The lemon goes so well with the tanginess of the sprouts. I have converted many sprout haters with it. How many cups in one serving size ? I'm sorry, I didn't measure how many cups I ended up with. My guess would be about 3/4 cup servings. Three pounds is a lot of broccoli. Can you sub fresh lime for the lemo? Yes. I prefer lemon on broccoli but lime would work too. This is delicious! I JUST made it. I added some fresh green beans to my broccoli and DELICIOUS! This is a keeper recipe! How long would this last in the fridge? Can I use garlic for garlic powder? Raw garlic is a little strong in this so if you do use it decrease the amount. Delicious! I love lemon and garlic together. I made this tonight along with bison rib eye steaks. Wonderful meal! Can you use frozen broccoli or does it have to be fresh?? The dressing will still taste good on frozen broccoli but I do recommend fresh. The dressing is great on almost any veggie or salad. This is very much like our favorite broccoli recipe: butter, lemon juice, garlic powder, and Parmesan. Yum! Ive been making this for years. Try it on Brussel sprouts. I have converted several sprout haters with this. YUM!!! oh my gosh, this looks soooo good. i'll be making it very soon. thanks for sharing the recipe. This looks fabulous! Is there a particular brand of olive oil you could recommend? Yum, yum, yummy! I needed this recipe yesterday for our Easter feast. Can't wait to try it. Thanks!